Description: Creme-de-le creme! Best buy for miles! 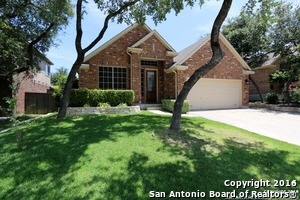 Beautiful 1 story newmark home w/all the bells & whistles on greenbelt! 10 ft ceilings, beautiful archways, 42 in cherry cabinets w/rope trim & crown, granite, tile backsplash w/decorative accent tiles, 16x16 tile floors, 8 ft front door, quiet zone insulation, recessed can lights, fluted legs on fireplace mantle, gas cooktop w/ burnercontrol lock, rounded corners, barrel arch over 2nd tub, sante fe doors, 3 ft garage extension, covered patio, sprinkler system etc!